Our made to measure kitchen doors and bedroom doors are sourced from one of the UK's leading manufacturers of vinyl wrapped MDF replacement doors. Bella Replacement Kitchen and Bedroom Doors are manufactured in Northern Ireland by BA Components, a privately owned family company with over fifteen years experience manufacturing premium quality vinyl-wrapped doors and accessories for kitchens, bedrooms and bathrooms. They use their knowledge, expertise and the latest robotic machinery to ensure that every Bella door is manufactured to the high standard you would expect from a high quality product. The substrate for each made to measure door is a top quality heavy duty 18mm MDF which is consistent throughout its thickness to allow for a perfect structure for (in particular) the deep-routered designs. In order to ensure highest quality of the finished article, the sheets of MDF are maintained at controlled temperatures, both in storage and during the manufacturing process when the vinyl sheet is glued to the doors and vacuum-pressed into the depths of the designs. The whole process is computer controlled and robotically executed to ensure consistency and to produce doors of the highest quality. This allows the manufacturer to provide a full 6 year guarantee of the quality of their products. The Bella range of replacement doors are available in 25 designs with a choice of 35 colour options including 4 High Gloss finishes. This extensive range will ensure that whatever your requirements, from an ultra modern kitchen to a traditional bedroom, the Bella range of Replacement Kitchen and Bedroom Doors will have something to suit your needs. Doors are made to order and available in a large number of standard sizes and can also be made-to-measure at no additional cost. 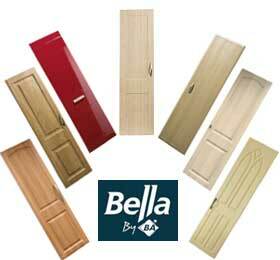 All Bella replacement doors are vinyl wrapped MDF. The MDF is the top quality premier grade heavy duty (FINSA Certificate available upon request). It is consistent throughout its 18mm thickness and therefore will allow all deep routered designs. The Vinyl wrap is known as a pressure vinyl and is usually between 0.45mm and 0.6mm thick. No thinner, wrapping grade vinyls are used. 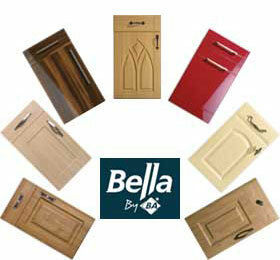 All Bella replacement doors are made to withstand the hard kitchen environment. The beauty of their construction is that MDF shouldn't ever warp or bow (particularly important on larger doors) and the vinyl wrap doesn't stain or discolour. To keep your made to measure vinyl wrapped doors looking their best, they should be cleaned only with a damp soapy cloth (never use cleaning materials containing solvents). Be very careful installing doors near heat sources such as ovens, radiators, grills, boiling kettles, etc. as there needs to be a suitable gap (i.e. 25mm) left for heat to disperse, or they need to be protected by suitable heat strips. If a door front is installed as an extractor fascia, the fan must remain on until the hob has fully cooled. With a little daily care and common sense the made to measure door and drawer front products should provide many years of good-looking trouble-free service. All Bella vinyl wrapped door products i.e. 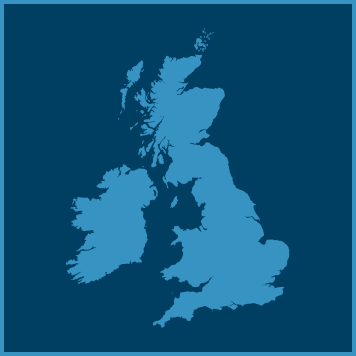 doors, drawer fronts and accessories are supplied with a full 6 year manufacturer's warranty. We bought a flat in August this year that had been completed last spring. Unfortunately the kitchen had been partially dismantled and more than half of the doors had been removed. The manufactures label was still attached and the internet found us DiyHomefit. New doors were ordered, delivered and installed. Now for the important bit the doors are high gloss cream and even though there is about 18 months difference in the manufacturing dates it is impossible to tell the old from the new in any way. Cannot recommend DiyHomefit and BA components strongly enough.